We have created a few different types of cactus crafts, but this is our first paper zig-zag cactus! 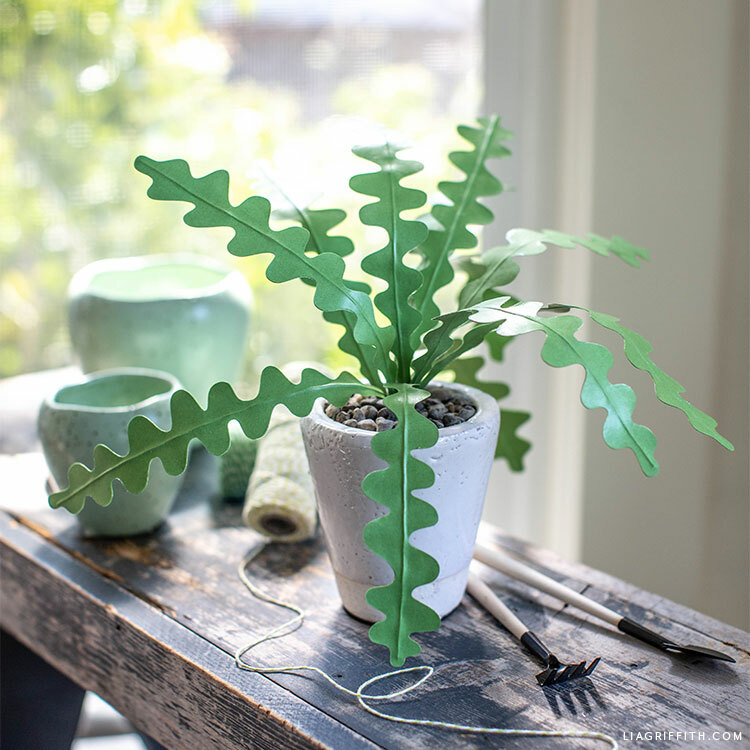 Designed by Krista, this plant is very easy to make and a great craft project for beginners. 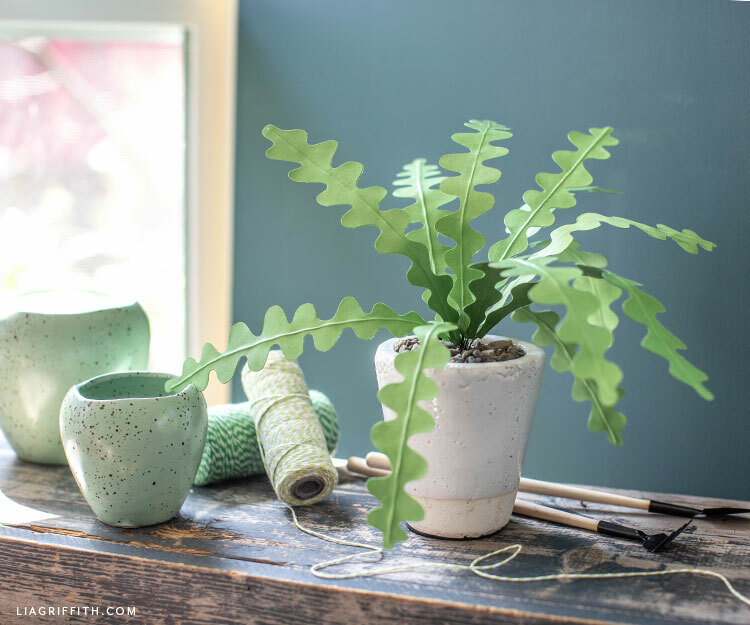 It’s also such a fun and simple way to bring a little pop of greenery into your home or office. Ready to get started? 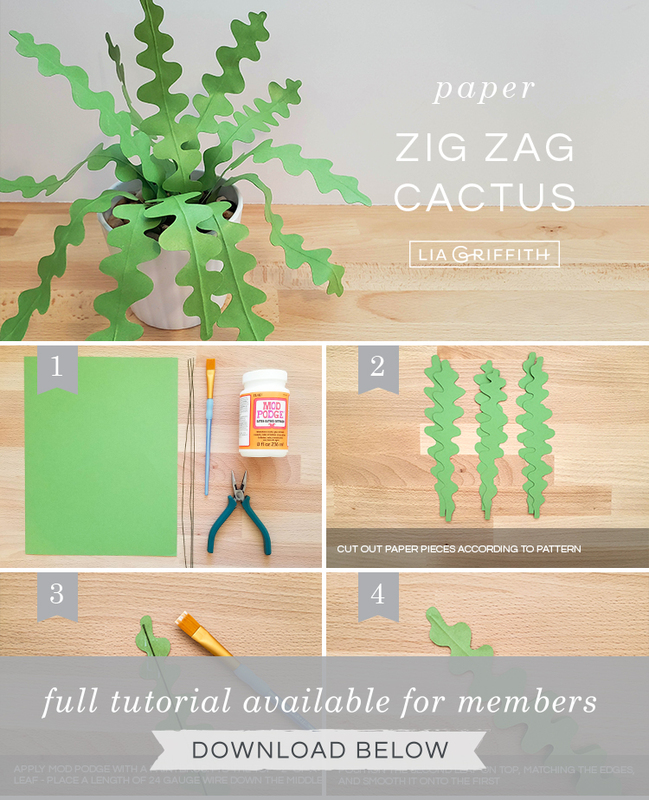 Just scroll on down to learn how to craft your own paper zig-zag cactus. The zig-zag cactus—also called a fishbone cactus and a ric-rac cactus—is known for its unique leaf pattern. We designed this zig-zag pattern for you, so all you have to do is download our design, cut it out, and follow our step-by-step tutorial. If you are using a cutting machine, you can use our SVG cut file. 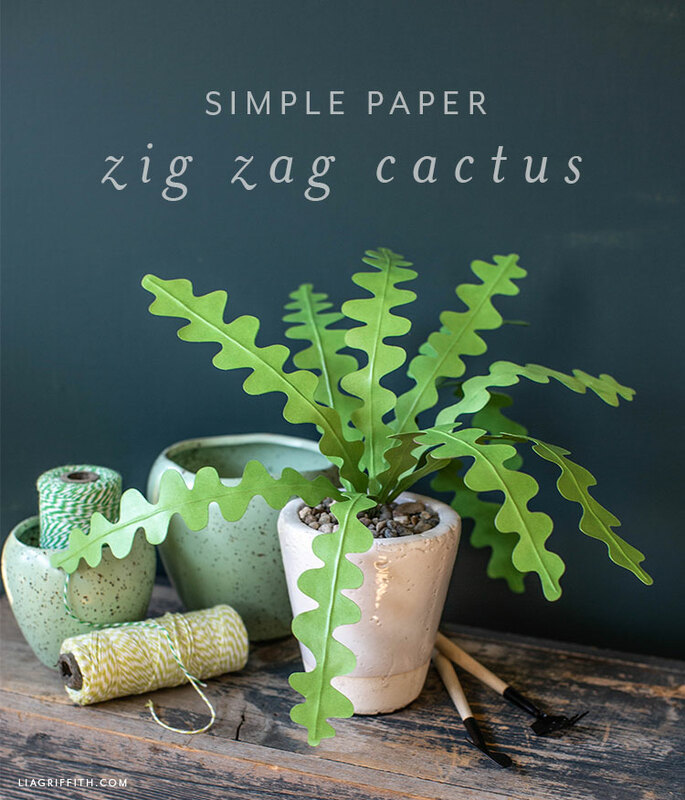 We have also included a PDF template if you are cutting your paper zig-zag cactus by hand. 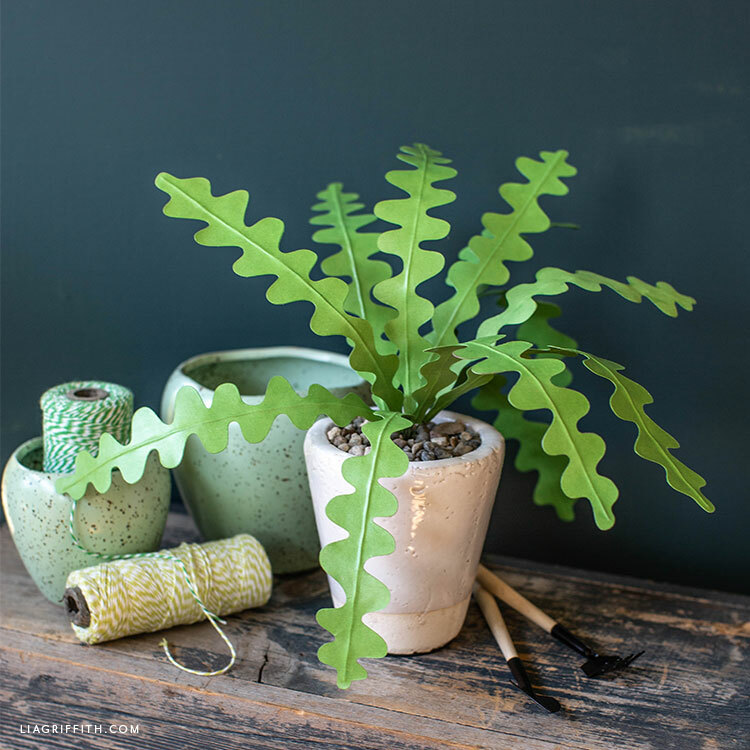 When choosing the paper for our zig-zag cactus, we decided to go with a vibrant green color. However, you may want to use a darker green shade for your cactus. It’s all up to you and whatever you like best! Once you’re done crafting your cactus, you can pot it using a small plant pot filled with foam and decorative rocks. Another fun idea you could try is to use a small hanging pot instead. Whatever you decide, please share it with us! We always love to see your version of our DIY projects, including how you decorate with them. When you’re ready to share, just post pictures on Instagram or Facebook with the hashtag #MadeWithLia. Or you can share it on our Facebook page for members. Gather your craft tools and materials. Then download the cactus pattern below. Cut out your paper pieces according to the pattern, using a craft knife or cutting machine (recommended). Cut two of each leaf shape to make one leaf. Our plant has 12 leaves total, four in each size. Apply Mod Podge with a paintbrush to roughly the top 2″ of a leaf. Place your 24-gauge wire down the middle and leave some room at the top. Position the second leaf of the same size on top, matching the edges, and smooth it down onto the first leaf. We’ve got more ideas for you! 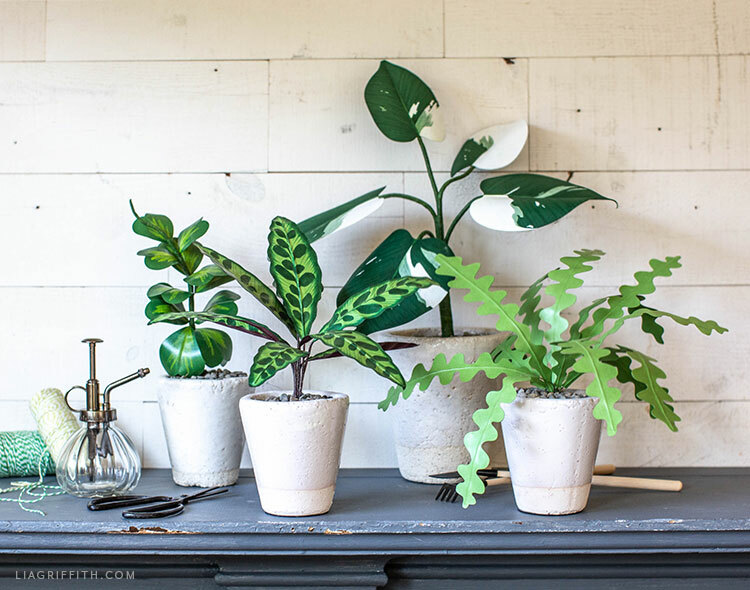 In the picture above, we have our White Knight philodendron, our variegated Sweetheart Hoya plant, and a new rattlesnake plant that we’ll be sharing with you soon. For daily DIY ideas, join us on Facebook, Pinterest, and Instagram. Or browse our YouTube channel for videos on how to make paper flowers, plants, and more. I love this idea, I am going to have to make some for my wife as unfortunately, she has a black thumb and even has a hard time keeping succulents alive. These she can’t kill but will have to figure out how to keep my youngest away from them.